The linen ground is a small lozenge diaper weave. 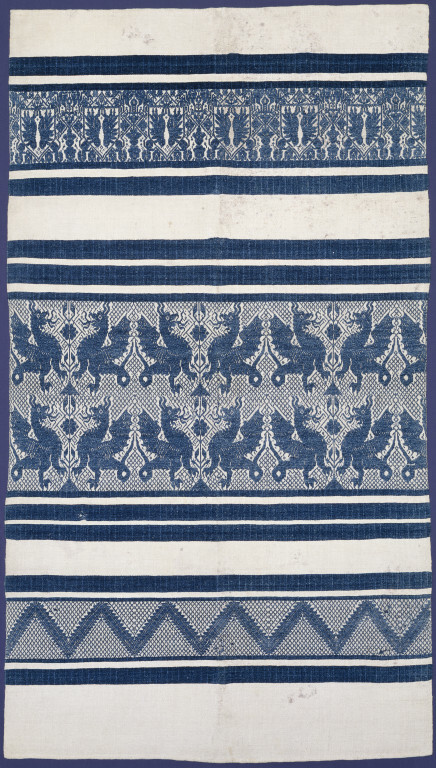 The towel came to the museum with a mixed group of other textiles from W B Chamberlin. There is no further provenance for it. Historical significance: The wyverns on this example are very similar to those depicted on a cloth laid on the table at the Last Supper - painting by Domenico Ghirlandaio (1449-1494), in the Cenacolo di Ognissanti in Florence. In the painting the way the pattern repeat works appears to show that two of the 'towels' have been laid side by side, slightly overlapping, as a cover for the table. 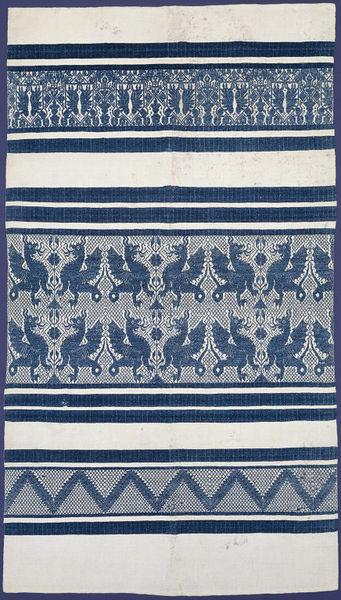 Antonino Santangelo in The Development of Italian Textile Design(1964) quotes from an inventory of 1482, which describes two napkins being '...in the style of Perugia' (banbagia a la perugina); if we infer that these are the blue banded towels under discussion, the association of them with this region appears to date back to at least the 15th century. However, Peter Thornton (The Italian Renaissance Interior 1991), while mentioning a reference to tovallie alla perugina in a 1574 inventory for Vasari's house in Venice, cautions that transcribers of inventories might misread alla parigina, meaning 'in the Parisian fashion', which he thinks likely to mean simply diaper-patterned; the finest table linen was produced in northern France, particularly Paris. 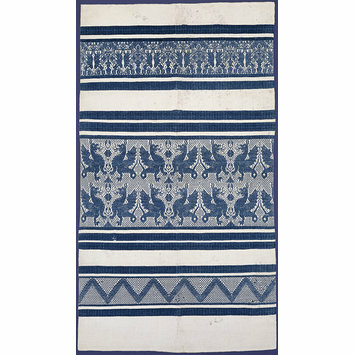 Endrei suggests that the towels' origin, influenced by designs from silks woven in Lucca, could go back to the 14th or even 13th century.